We have covered SpongeBob Squarepants products before on Coolest Gadgets, and I thought my favorite was the rectal thermometer until I saw the SpongeBob Speakers. 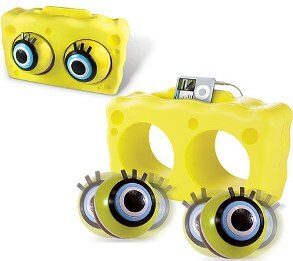 These SpongeBob Speakers from Npower is a way to play your music with the one who lives in a pineapple under the sea. The big buggy eyes that you see there are speakers, which can roll along to the music. And when I say roll along, I don’t mean that the pupils move to the beat of the music. I mean that when you lay them on a flat surface, these globes will move to and fro. I’ve included a YouTube video so you can watch this in action after the jump. As you can see, the SpongeBob Speakers have a Sponge dock on the top in order to hold whatever MP3 player you care to plug into it. You realize that once SpongeBob has his eyes out on the table, Plankton is going to be free to steal the Krabby Patty formula. Okay, I realize there is a whole slew of people who don’t get that joke, but you really need to watch some older seasons of SpongeBob Squarepants, and The SpongeBob Squarepants Movie is one of the funniest ever made. You should be able to purchase the SpongeBob Speakers from stores like Toys ‘R’ Us for about $39.99.